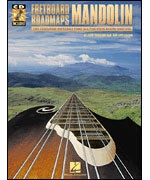 The latest installment in our popular Fretboard Roadmaps series is a unique book/CD pack for all mandolin players. The CD includes 48 demonstration tracks for the exercises that will teach players to: play all over the fretboard, in any key; increase their chord, scale and lick vocabulary; play chord-based licks, moveable major and blues scales, first-position major scales and double stops; and more! Includes easy-to-follow diagrams and instructions for all levels of players.